Dominic is a Freelance illustrator and Graphic designer in Dubai, U.A.E.. 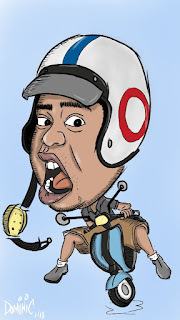 He started drawing caricatures in 2010 in his hometown of Manila, Philippines, since then he continuesly spending time practicing and doodling to enhance and develop his skills in both Traditional and Digital media. Dominic made the move to Dubai, U.A.E. in 2014 to Work as an IT Administrator and Graphic Designer. Dominic has drawn traditional and digital caricatures for Family and Friends from Philippines and in Dubai.